Welcome to day 2 of the Waltzingmouse Stamps February release previews. Nine sets will be released on the 29th of February! Today we're looking at Nordic Spring and Florentine Frippery, two stunning sets jam packed full of elements! My first card features Nordic Spring (and a label from Very Vintage Labels No.10). This butterfly is definitely one of my favorite elements in the set, so I decided to make a feature of it on my card. Stamped with VersaMagic Pink Grapefruit it really is a generous size, I can't wait to make a butterfly background with this one! As I mentioned the label is from Very Vintage Labels No.10 stamped in Memento Rose Bud. My other favorite part of the Nordic Spring set is the tulip border and individual tulip stamp!! Here I stamped the tulip border in VersaMagic Tea Leaves, cut out, stamped another border with the individual tulip stamp (in pink and green), cut out and layered on top, giving me a little tulip garden! 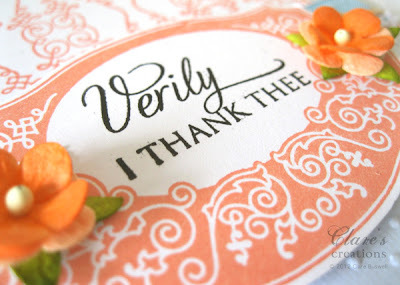 : ) The sentiment I over stamped is from yesterday's preview French Country. My second card features stamps from Florentine Frippery, a very fancy set!! There are three fab labels, two beautiful border stamps, two sentiments and some individual motifs packed into this stamp set. 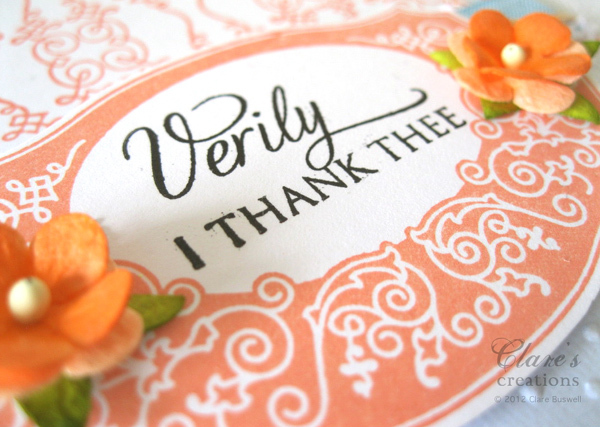 I used one of the gorgeous labels and stamped it in VersaMagic Pink Grapefruit, the sentiment is from the same set. I just love the elegant font! The sweet little blossoms are from Wild Orchid Crafts. 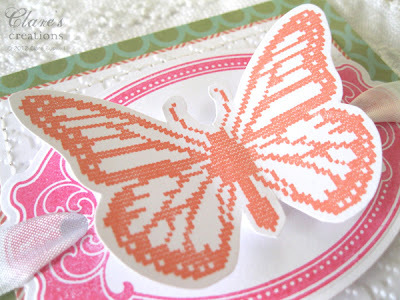 I used one of the gorgeous border stamps to build the background pattern again using VersaMagic Pink Grapefruit. I really love both of these sets, I know I'll get a lot of use out of them, so much to play with!!! Here are the ladies sharing previews today. Oh and we have more gorgeous sets for you tomorrow!! Claire - the colours here are so pretty. Your cards are really lovely - I really like the verily sentiment! Fab! Beautiful cards Clare. Love your choice of colour, so fresh and Spring like. Great designs. Beautiful cards Clare, just stunning! LOVE the first card so sweet and gorgeous ..love the tulip border a must have! 2 lovely creations Clare! Wonderful colors on both! love the butterfly perched on top of the pink label with the pretty row of layered tulips below - and your background stamping on the 2nd card is beautiful! Such fun spring colours - love what you created Clare. So gorgeous, Clare! Your creations are like a fresh spring breeze :) Love your Nordic card with the butterfly perched on the label and the lovely textures. Your Frippery card looks amazing with that stamped background! You are a master of color! Love the bright garden feel to these cards - your stamping with the frippery set is perfection! GORGEOUS! Gorgeous cards and beautiful colors. 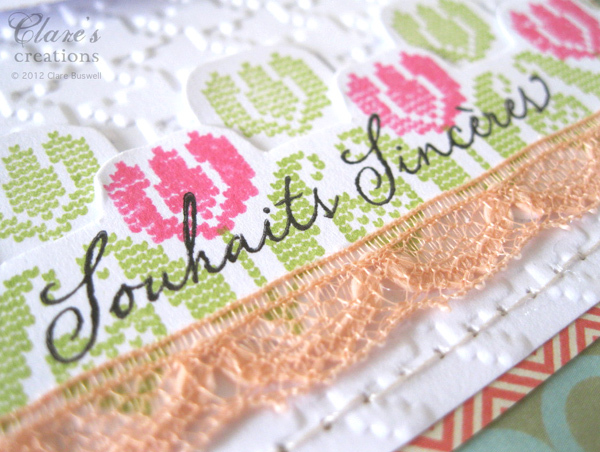 Gorgeous cards and beautiful spring colors Claire. Love the tulip/butterfly combo. What a gorgeous set of cards, I love the pattered paper you created and that is the most beautiful butterfly! gives it a "quilted" look that just compliments this card incredibly!! Gorgeous, Clare--love the butterfly and tulips! And the patterns you created are so lovely! Beautiful! I love the way you used the Frippery set to make the background. That set is definitely going on my list! 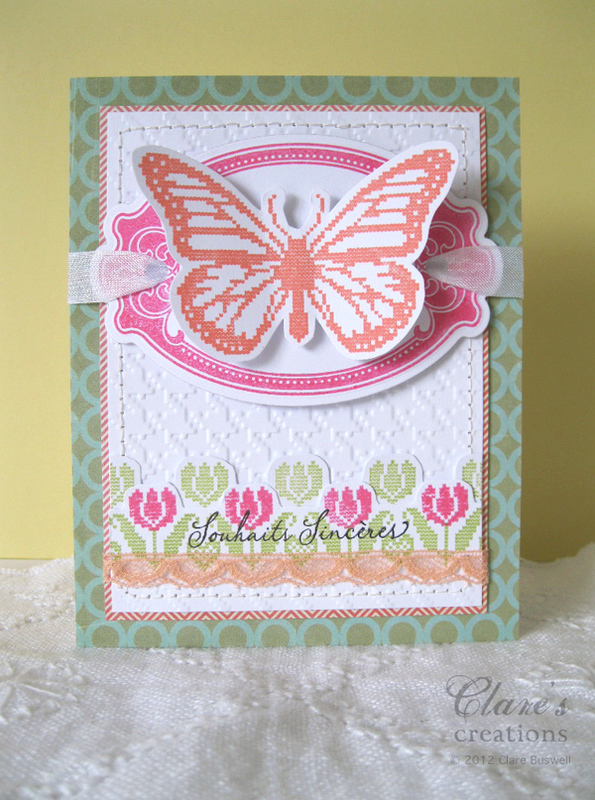 Claire, your first card is so charming with the butterfly as the focus and the sweetly embossed bg with the tulips!! And I love the beautifully elegant second one too!! Two gorgeous creations!! Hey birthday Girl, such pretty cards! I like the soft colors and the lace is a nice touch. I LOVE Nordic Winter so I am PSYCHED to see the full reveal of this set too! Wonderful projects Clare! That butterfly is gorgeous! Clare these are dreamy! I love the colors - you've done a beautiful job with all!! Such gorgeous cards! You Make me think of Spring! Oh my goodness! Your tulip border is amazing! Love the bright springy colors you used, too. 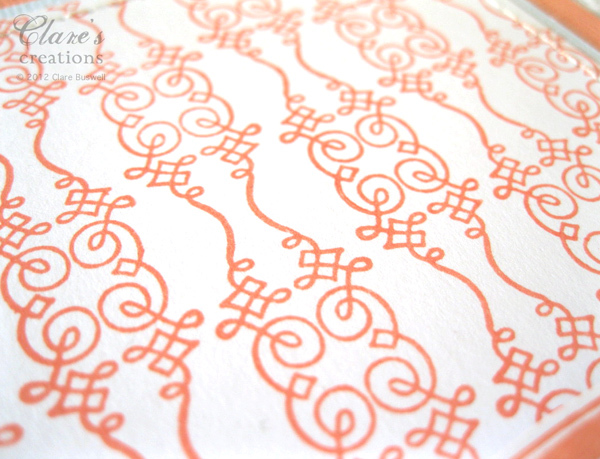 The second card is a stunner - that peachy color is one of my favorites and the layout just lets all the elements shine. Beautiful!